many of my friends know that i don't drink coffee. it's an interesting subject of conversation considering that i survived law school without this dark brew which i understand keeps people awake. my appreciation for coffee is so primitive that i cannot comprehend people who have such a low regard for a 3-in-1. once, i took on a challenge to drink civet cat coffee, which my host guaranteed will change my mind about the drink (so certain was he that he promised i'd pick up the habit), and after obliging to finish the small cup, i flatly replied: it tastes pretty much like how coffee should be (and that was, by far, the only full cup of coffee i've had in my life). so getting invited to kuppa in BGC on a saturday afternoon was possibly not the most exciting thing to do. at least, until i realized that although it's branded as a roastery and café, they actually have a well-equipped kitchen orchestrated by a chef trained in classical italian cuisine that ships out very delectable meals. kuppa might be familiar to bacolodnons, having raked a faithful following over the years. 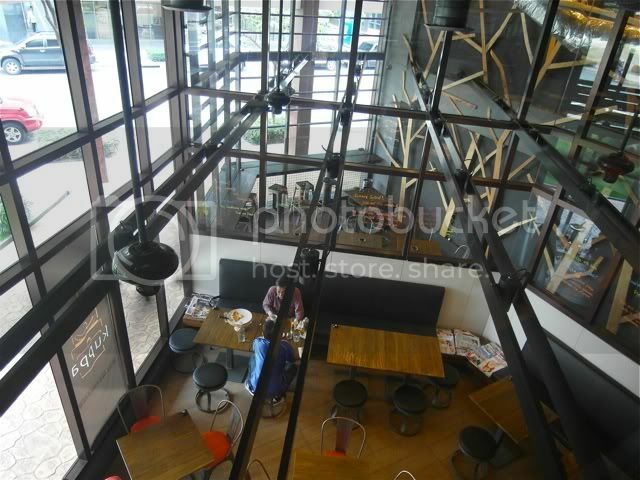 last january, they opened a branch here in bonifacio global city. its logo might look like a coal-fired train, but once you go inside, you'd realize that it's actually what sets kuppa apart from all cafés: it's a coffee roaster. coffee is roasted fresh as many as three times a week in this expensive piece of equipment that resembles a machine from a sci-fi movie. it's probably not how you'd imagine a coffee roaster would look like, but after it's primed, coffee is roasted in as little as 5 minutes. 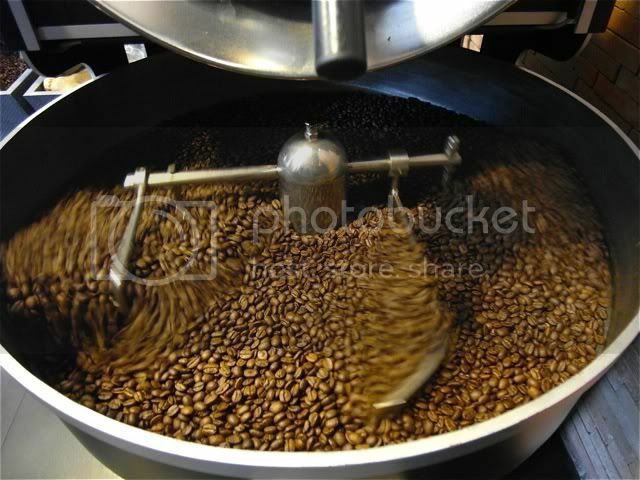 there is no single formula, apparently, for roasting coffee beans, not even if they're the same kind, or come from the same farm; each harvest is different, so when a fresh batch comes in, karen -- a professional cupper -- has to roast several batches until they get the taste right. i didn't know until then that there's training available for anyone who wants to be able to taste coffee, and karen is possibly the first (and probably the only) filipino to be licensed as a coffee Q grader. i'm not into coffee, but i like any kind of information, so i at least found this part a little interesting. and although kuppa's coffee will not be getting return visits from me, i will definitely be back for the food. now i'm probably not the best food critic out there since i'm appreciative of many things and will give glowing reviews most of the time. it's not that i have such low standards, or that my palette is not discerning. it's just that i normally don't want to ruin my experience when i'm eating by having to trouble myself with small details, that i actually forget i'm eating. of course, when something is supremely bad, i'd say it. we started the day with some sandwiches. one was prosciutto and pumpkin while the other was a ham and jam sandwich. they sound very different although tasted quite alike. 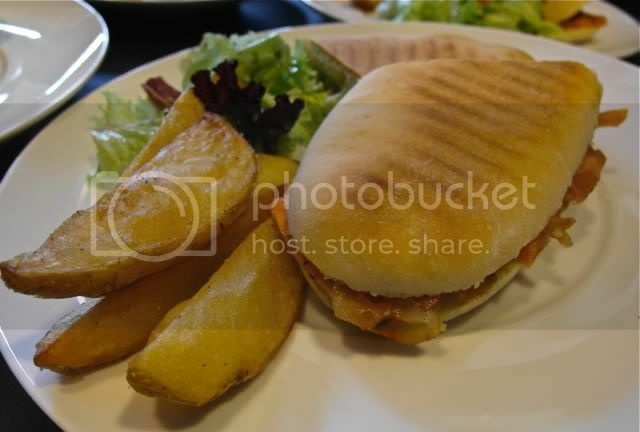 they were very good sandwiches, and the french fried potato wedges make you wonder why you even eat fries from mcdonald's, but i was saving up some hunger for the later servings. 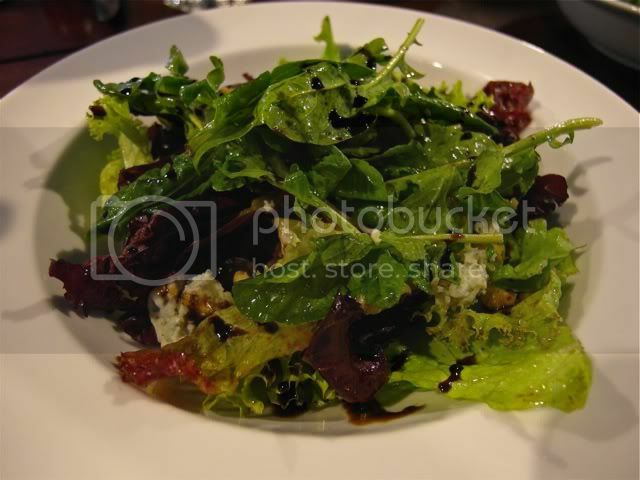 the insalata kuppa was nicely done, you almost don't notice it's dredged with really funky blue cheese. 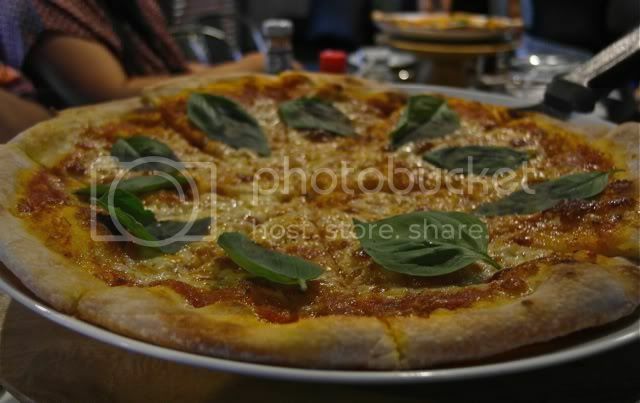 like i said, the chef was trained in italy, so of course we started with some standard italian dishes: pizza and pasta. the pizzas, the chef was proud to announce, wasn't shaped using a rolling pin. they're kneaded by hand. i actually asked why this was so and he replied that it had something to do about not flattening the dough, such that air is kept inside. while baking, the dough rises, and it's served with some ruptured bubbles. we had two types: the margherita and the cristina (named after the chef's wife -- and in kuppa, many of the dishes are named after actual living persons). 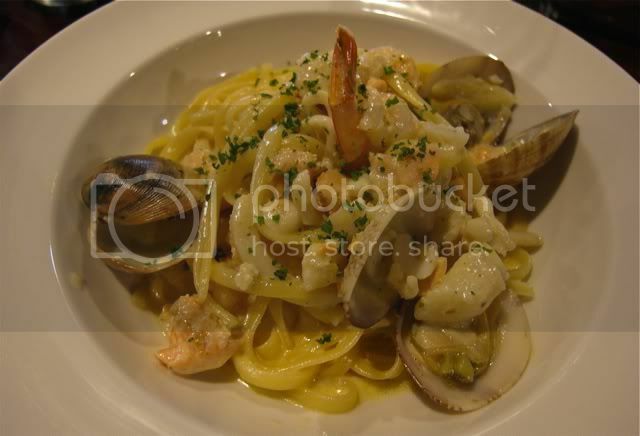 the frutti di mare pasta was served two ways: the first with olive oil, and the second being cream-based. now if you throw in seafood and pasta together, you can never go wrong where i'm concerned, but i did prefer the olive-based one. and then the train arrived, so to speak, pulling with it carriage after carriage of goodness. the next four offerings just happened to be some of my favorite things to eat. 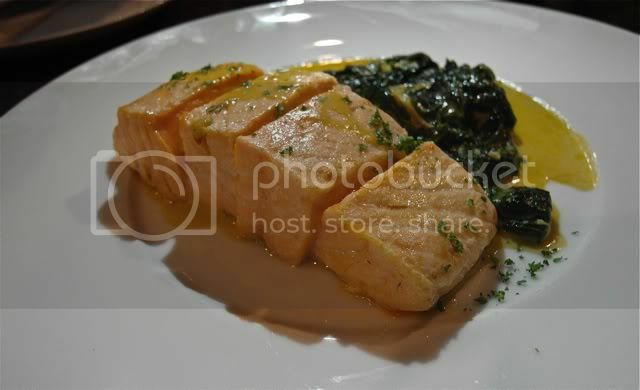 first was a salmon with cream sauce: the fish was pan seared, and it crumbled when i attacked it with my fork. this is how it's supposed to be: without that crusty feel outside and that dry, bland flavor inside. and i'm not a big fan of vegetables, but i ate a lot of the creamy spinach sidings. 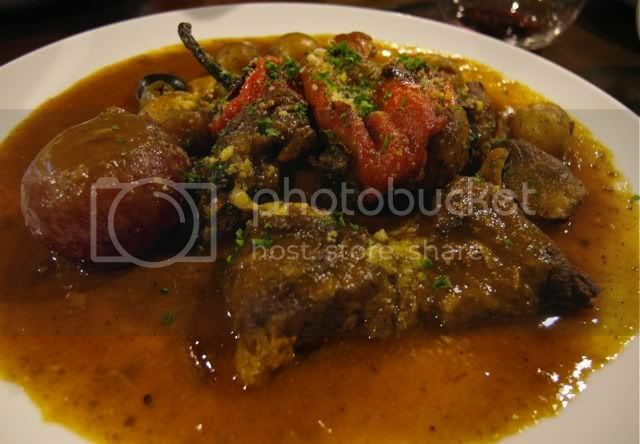 at this time, karen decided to switch our meals and served the beef salpicao first. ever since i started eating proper steak, i realized that it should never be served overcooked. 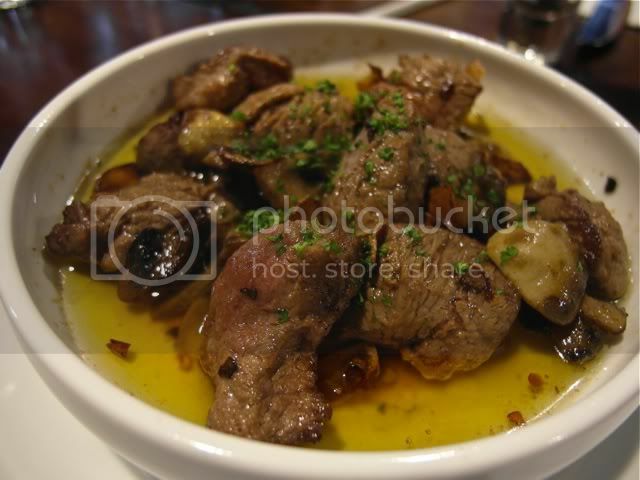 the salpicao, done without any fancy fusion ideas, was almost medium rare: tender to the bite, and soaked in all the juicy goodness of beef. along with the salmon, i will most likely have this again when i return. i don't know if i've eaten lamb kaldereta before but this was absolutely surprising, i had to ask how they took away the lansa we associate with lamb. the meat fell off the bone (although i may be wrong -- there wasn't any bone there actually), and yet had a stronger and more distinct bite to it. 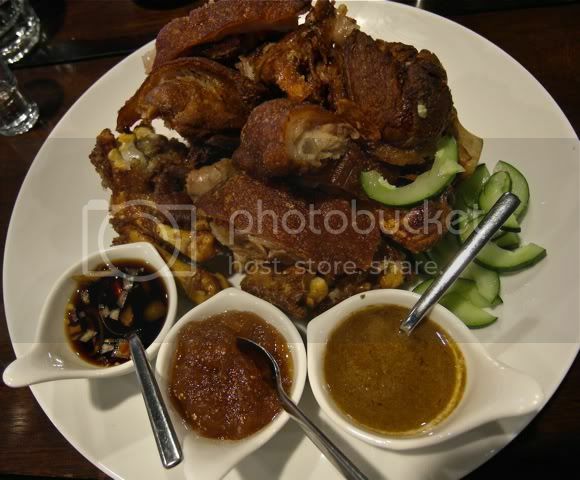 we ended the meals with the pièce de résistance: crispy pata, in all its traditional deep fried goodness. by this time of course i was already quite full, i wondered why this was served last. then i realized if it had been placed first, i probably would not have managed to taste anything that followed. the crispy pata was both crunchy, chewy, and tender in the right places. the twist here concerned the sauces: aside from the traditional soy sauce, there was also a dollop of pureed liver and apple chutney which went well together. 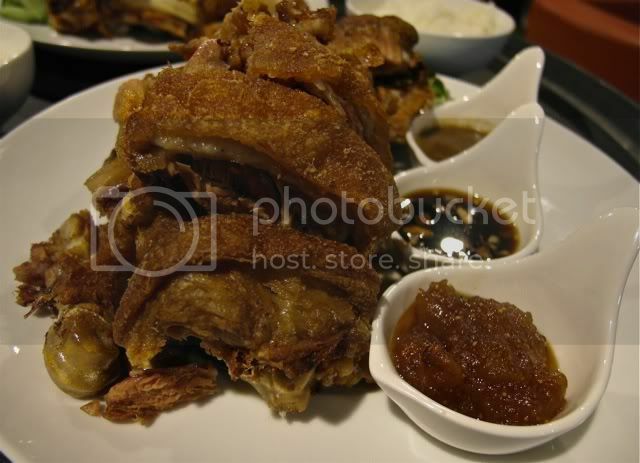 i normally just snack on crispy pata while having beer, but this one can actually be eaten during a slow-moving meal, appreciating the nuances of the sauces and the way the meat was fried to perfection. now i'm beginning to sound like a food commercial, but i really liked this. after lunch we had some teas, which washed away any after tastes lingering in my mouth and preparing me for dessert. i completely enjoyed matt's chocolate cake: a sinful and glorious rendition of the easy-to-ruin lava cake. by this time i was giving nicknames to the meals and i called this one "mattcho". there were four different coffees there and everyone else seemed to pine over them. they had something local from davao called the hinelaban brew and then a glass of africa courtesy of the ethiopian yergacheffe. a third coffee was called the ben's cappuccino ("bencap"). they enjoyed all these freshly brewed cups so i guess they were pretty good. i'll take their word for it. so although it's a little out of the way if you're not around the BGC area, kuppa is a nice place to enjoy real coffee -- a lot of places claim that but kuppa's owners have the stripes to declare that they know coffee. but also, it's a great place to eat good, no-nonsense, non-fancy food. i'll be returning one of these days -- perhaps after a sunday race, or a lazy saturday -- so i better call ahead for the mattcho. apparently, they prepare it when it's ordered. by the way, i have some coffee beans which i have no use for. it'll go to anyone who first leaves a comment.